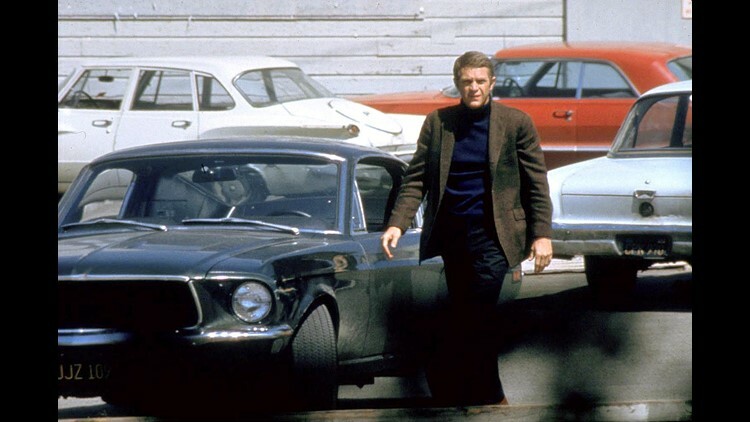 Steve McQueen in a scene from the motion picture "Bullitt" in 1968. Want to start an argument? The folks at British insurance-shopping website GoCompare have created a list of the movies' most iconic, popular and frequently seen cars. It shows the timeless Ford-Chevy rivalry is in full swing onscreen. Ford got the nod as the brand most frequently seen in movies and for the top two models: Mustang and the Crown Victoria. Chevrolet notched spots 3 and 4 with the Impala and Caprice. What’s that mean? One Bullitt, in which Steve McQueen essentially co-starred with a Mustang fastback, outranks a thousand cabs dropping characters off at a hotel. Robert DeNiro’s deranged Taxi Driver should’ve got Checker back in the game, but apparently not enough people love Scorsese’s dark masterpiece. A few inclusions and omissions are baffling. • In a Hollywood injustice that rivals The English Patient victory over Fargo for best movie, the Audi A8 makes the list in the 2000s for Transporter 2 but not the '90s for Ronin. • The biggest surprise is the most iconic car for the decade of the 2000s: Clint Eastwood’s treasured Ford Gran Torino, from the movie of the same name. A Chevy Camaro from Transformers finished second. • Always a bridesmaid, never a bride, the Camaro concept from Transformers: Age of Extinction finished No. 2 behind the Mad Max: Fury Road post-apocalyptic Tatra 815-7, the giant truck driven by Charlize Theron. It’s hard to dispute the No. 1 model on the list of iconic vehicles though: The DeLorean DMC-12 that powered Marty McFly’s trips in Back to the Future rules time and space. Actors Mark Wahlberg and Jack Reynor filming of Transformers: Age of Extinction in GM Design Dome in Warren in June 2013. In the center is Bumblebee, a highly modified, vintage 1967 Camaro SS.